The name Jaffa Gate is currently used for both the historical Ottoman gate from 1538, and for the wide gap in the city wall adjacent to it to the south. The old gate has the shape of a medieval gate tower with an L-shaped entryway, which was secured at both ends (north and east) with heavy doors. The breach in the wall was created in 1898 by the Ottoman authorities in order to allow German emperor Wilhelm II to enter the city triumphally. The breach and the ramp leading up to it are now allowing cars to access the Old City from the west. The L shape of the historical gateway was a classical defensive measure designed to slow down oncoming attackers, with its outer gate oriented in the direction of Jaffa Road, from which travellers including pilgrims arrived at the end of their journey from the port of Jaffa. Both the Jaffa Gate and Jaffa Road are named after the port of Jaffa, from which the Prophet Jonah embarked on his sea journey and pilgrims debarked on their trip to the Holy City. Nowadays the name Jaffa Road is only used for the city street going through the city of Jerusalem outside the historical Old City, while the multi-lane modern road further connecting it westwards with Tel Aviv-Jaffa is part of Israel's Highway 1. The current Arabic name for the gate, Bab el-Khalil, literally "Gate of the Friend", refers to Abraham, "the beloved of God". Since by tradition the burial site of Ibrahim/Abraham is in Hebron, the Arabic name of the city is El-Khalil, so the Arabic name for the Jaffa Gate translates as "Hebron Gate". In medieval times the Arabs used to call this gate Bab Mihrab Dawud, or "Gate of David's Chamber or Sanctuary", out of the belief that the room atop the Herodian tower stump represented the "private chamber" or "prayer room" of Prophet Dawud, which is specifically mentioned in the Koran (Surah 38. Sad, Ayah 21). Prophet Dawud is how King David is known in Islam. 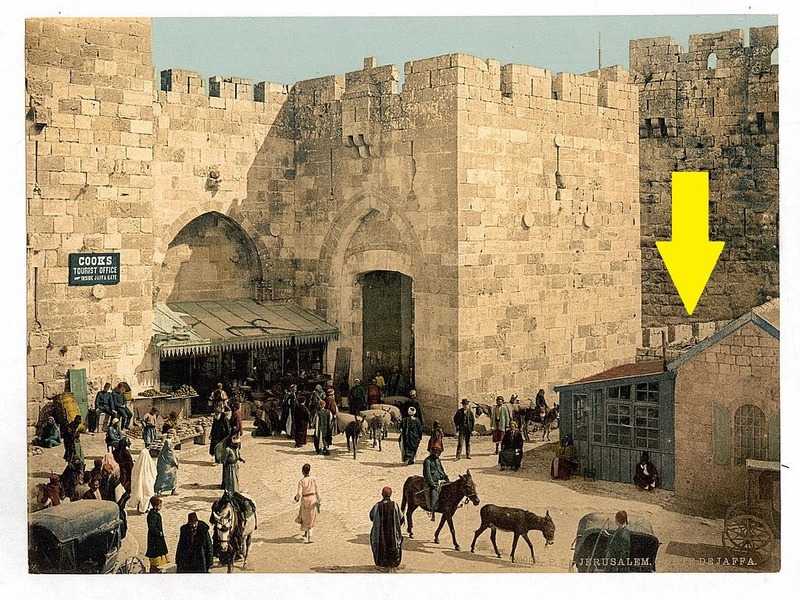 The Crusaders, who rebuilt the citadel to the south of Jaffa Gate, also built a gate behind the present location of Jaffa Gate, calling it "David's Gate". The Tower of David is an ancient citadel located near the Jaffa Gate entrance to the Old City of Jerusalem. Built to strengthen a strategically weak point in the Old City's defenses, the citadel that stands today was constructed during the 2nd century BCE and subsequently destroyed and rebuilt by, in succession, the Christian, Muslim, Mamluk, and Ottoman conquerors of Jerusalem. The strong bulwarks still seen today surrounding the base of the tower are believed to have been built by king Herod, in memorial of his brother, and was formerly named the Tower of Phasael (Hebrew: מגדל פצאל). During the Jewish war with Rome, Simon bar Giora made the tower his place of residence. Of the original tower itself, some sixteen courses of the original stone ashlars can still be seen rising from ground level, upon which were added smaller stones in a later period, which added significantly to its height. The site contains important archaeological finds dating back 2,700 years, and is a popular venue for benefit events, craft shows, concerts, and sound-and-light performances. The Ottoman clock tower stood between 1908 and 1922. In 1907 a clock was placed on the roof of the gate, and in 1908 a very ornate clock tower was built on top of Jaffa Gate' historical gate tower. Apart from serving the developing business district in the upper part of the Hinnom Valley, it was meant to be one of approximately one hundred such clock towers built throughout the Ottoman Empire in 1900 in celebration of the 25th year of rule of Sultan Abdul Hamid II; but because of the high cost of 20,000 francs and the poverty of the city, the money was not raised in time and the clock tower was not completed until 1908. Seven such clock towers were erected in what are now Israel and the Palestinian Territories – in Safed, Acre, Haifa, Nazareth, Nablus, Jerusalem, and the famous tower in Jaffa. The fact that the Jaffa Gate in Jerusalem was selected for the clock tower indicates the gate's importance at the time, even more than the Damascus Gate. The clock tower was built of limestone quarried from the nearby Zedekiah's Cave. It stood 13 feet tall, and was topped by four clock faces, oriented to the cardinal compass points. The eastern and western faces showed official time (European time) while the northern and southern faces showed local time. Above the clock faces was a bell and the crescent-and-star symbol of Ottoman rule. The Turkish clock tower only lasted for a decade and was knocked down by the British in 1922 – for aesthetical reasons. The clock itself was re-erected on a modern, far less decorated tower at Allenby Square near the British Post Office and City Hall; this British-built tower was itself ultimately demolished in 1934. The British authorities attempted to recreate the historical aspect of the 16th-century city walls and gates and considered the clock tower to be an unaesthetical, disfiguring addition. As part of the same general plan, all recent buildings set against the city walls and gates, were demolished as well. Outside the 1898 breach in the city wall at Jaffa Gate, on its southern side and near the Bezalel Pavilion, was the so-called Sultan's Sabil, built in 1900 or shortly before that. It, too, was removed in 1921 by the British authorities. The Bezalel Pavilion near Jaffa Gate. The Bezalel Pavilion near Jaffa Gate was a tin-plated wooden structure with a jagged roof and tower, built in 1912 as a shop and showroom of the Bezalel School of Arts. It was designed specifically for tourists and passersby on their way to and exiting the Old City. The pavilion was demolished six years after it was erected. The site of Kilometre Zero, at the plaza in front of Jaffa Gate. After the recapture of Jerusalem in CE 132 the emperor Hadrian had the city rebuilt as a Roman city called Aelia Capitolina and a tall pillar in the plaza inside the Damascus Gate was the starting point for measurements to other cities, as indicated in the mosaic Madaba Map. This pillar appears to have fallen or been demolished during the Byzantine period. In the 20th Century the plaza outside the Jaffa Gate served the same purpose. During the British Mandate for Palestine a marker outside the doorway served as the zero point for distances to and from Jerusalem. There is no such marker today. Jaffa Gate was inaugurated in 1538 as part of the rebuilding of the Old City walls by Suleiman the Magnificent. Just inside the gate, behind an iron grating on the left, lie two tombs. These belong to two Ottoman-era notables, but a folk legend attributes them to the two architects whom Suleiman commissioned to construct the Old City walls. According to legend, when Suleiman saw that the architects had left Mount Zion and the tomb of King David outside of the enclosure, he ordered them executed. However, in deference to their impressive achievement, he had them buried inside the walls next to Jaffa Gate. In 1917, British general Edmund Allenby entered the Old City through the Jaffa Gate, giving a speech at the nearby Tower of David. Allenby entered the city on foot in a show of respect for the city and a desire to avoid comparison with the Kaiser's entry in 1898. In 1944 the British demolished the row of houses erected against the outer face of the city wall leading down to Jaffa gate from the north, in an attempt to preserve Jerusalem's historic vistas. During the 1948 Arab–Israeli War, Israeli forces fought hard to connect the Jewish Quarter of the Old City with Israeli-held western Jerusalem by controlling the Jaffa Gate. Israeli forces were not able to gain control of the gate until the Six-Day War in 1967. In 2000, Pope John Paul II came through Jaffa Gate to the Old City during his visit in Israel in the Holy Year. The street leading east from the Jaffa Gate was once called "Capital Street"[dubious – discuss] but today is known as "David Street" and is one of the main streets for souvenir shopping. View of Jaffa Gate (left) and the Tower of David (right). Inside Jaffa Gate is a small square with entrances to the Christian Quarter (on the left), Muslim Quarter (straight ahead) and the Armenian Quarter (to the right, past the Tower of David). A tourist information office and shops line the square. The entrance to the Muslim Quarter is part of the suq (marketplace). The gate's location is determined by the city's topography. It stands at the point where the valley followed by Jaffa Road meets the city wall at the upper end of the Transversal Valley, which bisects the Old City in a roughly west–east direction, between the northwest ridge and the southern hill known as Mount Zion. Inside the city, the road (today's David Street) and the Transversal Valley it now follows continue eastward and down into the Central or Tyropoeon Valley, separating the city into a northern and a southern half, with the Christian and Muslim Quarters to the north, and Armenian and Jewish Quarters to the south. Jaffa Gate is heavily used by pedestrians and vehicles alike. In the early 2000s (decade), the road straddling the gate was moved further west and a plaza constructed in its stead to connect Jaffa Gate with the soon-to-be-built Mamilla shopping mall across the street. In 2010, the Israel Antiquities Authority completed a two-month restoration and cleaning of Jaffa Gate as part of a $4 million project begun in 2007 to renovate the length of the Old City walls. The clean-up included replacing broken stones, cleaning the walls of decades of car exhaust, and reattaching an elaborate Arabic inscription erected at the gate's original dedication in 1593. Bullet fragments in the gate, from fighting in the 1948 Arab–Israeli war, were preserved. Infrastructure work beside Jaffa Gate also uncovered an ancient aqueduct dating from the 2nd or 3rd century AD. A panoramic view of the modern Gate's plaza. Note the gap in the walls now used for vehicular access to the Old City. ^ "Al-Quran Compare Translation - Al-Quran Surah 38. Sad, Ayah 21 - Alim". www.alim.org. ^ a b "The Re-Inauguration of Jaffa Gate in the Old City". Israel Antiquities Authority Press Office. Retrieved 2010-05-03. ^ a b "Jerusalem reopens Jaffa Gate after two-month renovation". Haaretz. 2010-04-21. Retrieved 2010-05-03. ^ Eliyahu Wager (1988). Illustrated guide to Jerusalem. Jerusalem: The Jerusalem Publishing House. p. 121. ^ 1831-1885, Bonfils, Félix, (12 June 1870). "[Interior of Jaffa Gate from near Hotel Mediterranean]". www.loc.gov. ^ "[The Jaffa Gate, Jerusalem, Holy Land]". www.loc.gov. 12 June 1890. ^ "ירושלים שלתמול / דודילין". 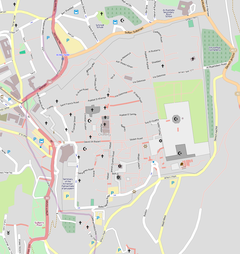 benyehuda.org. ^ Geva, Hillel (1981). "The 'Tower of David'—Phasael or Hippicus?". Israel Exploration Journal. 31 (1/2): 57–65. JSTOR 27925783. (Registration required (help)). While biblical scholar Robinson and archaeologist Geva proposed that the tower known as Hippicus be identified with the "Tower of David," this proposal was not accepted by archaeologists J. Fergusson, Thomas Lewin, Schick, G.A. Smith, C. Warren and C.R. Conder, who held that the tower of Phasael should be identified with the "Tower of David," based on its size. ^ Jerome Murphy-O'Connor, The Holy Land: An Oxford Archaeological Guide from Earliest Times to 1700, Oxford University Press (5th edition), New York 2008, pp. 23–25 ISBN 978-0-19-923666-4; with an illustration showing the contour of the Phasael Tower walls, and walls built in later centuries. ^ a b Goldhill, Simon (2009). Jerusalem: City of Longing. Harvard University Press. pp. 146–147. ISBN 978-0674037724. ^ a b c The Palestine Exploration Fund: Breach in the city wall of Jerusalem, between Jaffa Gate and the Citadel. ^ "Lions in Jerusalem". Jerusalem Municipality. Retrieved 2010-05-03. ^ "Edmund Allenby Entering Jaffa Gate, Jerusalem – Signed Photograph". Shapell Manuscript Collection. SMF. ^ Kean, James (1 December 2004). "Among the Holy Places: A Pilgrimage Through Palestine". Kessinger Publishing – via Google Books. ^ "Jerusalem's Jaffa Gate is reopened". Jewish Telegraphic Agency. 2010-04-21. Retrieved 2010-05-03. ^ "The 1,800 Year Old High-Level Aqueduct of Jerusalem was Exposed Next to Jaffa Gate in the Old City". Israel Antiquities Authority Press Office. 2010-02-19. Retrieved 2010-05-03. Wikimedia Commons has media related to Jaffa Gate. Mashiah A., Avraham Y., Kacho E., Avrahami M., Yogev A. (2008). Conserving the Engineers’ Tombs in the Jaffa Gate Plaza, Conservation Department – Israel Antiquities Authority.